An in-form Wolfsburg coming up against Roger Schmidt’s exciting Bayer Leverkusen side was always going to be a fascinating tie. And so it was, being one of the best and most dramatic matches I have ever watched. Wolfsburg, who were unbeaten in eight going into this tie, started with the same 4-2-3-1 that had helped them beat Hoffenheim 3-0 last weekend. Bayer Leverkusen also started with a 4-2-3-1 but changed to more of a 4-2-2-2 shape after going into half-time 0-3 down. Leverkusen’s problems without the ball were pretty endless. It is important to note that they didn’t have their full compliment of defenders to choose from with Jedvaj, Wendell and Toprak all out however Leverkusen’s issues extended beyond just their back 4. Firstly, Schmidt’s famous counterpressing wasn’t as effective as it has been in the past and actually caused Leverkusen many problems. For their first goal, Leverkusen had eight players counterpressing in a small (roughly 10mx25m) area of a pitch in their wide right position. Wolfsburg’s quick, accurate passing helped them escape the counterpress and switch the ball to Bayer’s left flank. They had loads of space to counter attack and score due to neither Papadopoulos or Hilbert picking up Dost. Leverkusen’s counterpressing did work at some stages during the half but not often enough for it to be worthwhile and they often carried on this counterpress for longer than 5 or 6 seconds which meant it was easier for Wolfsburg to escape and there was more space for them to exploit when they did so whilst making their high line vulnerable. Wolfsburg often left 2 or 3 men on the last line when they lost the ball for this reason. Die Werkself had more problems in the defensive transition due t0 their use of limited fullbacks. This may seem stupid as surely not having your fullbacks high up the pitch would mean that you are more defensive solidly, especially being less vulnerable in transition. 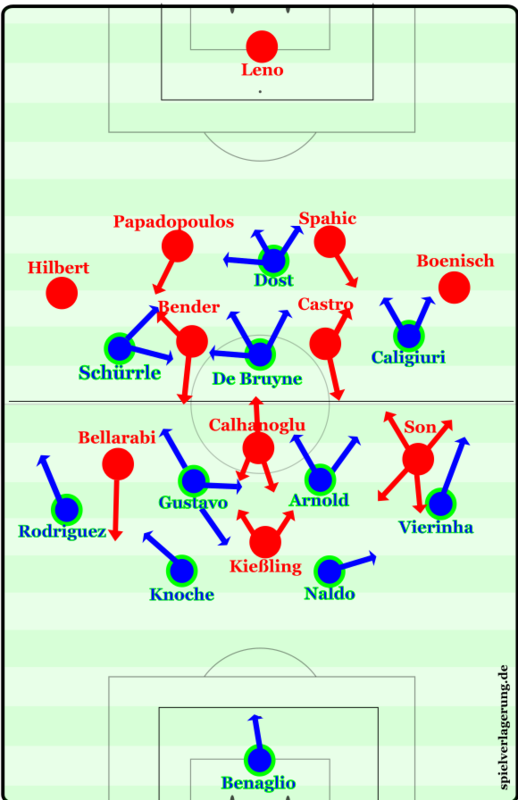 However, the fullbacks staying back meant that Bayer’s double pivot had to play high up the pitch to give them good attacking numbers. This meant that there was always a huge space centrally in front of the Leverkusen defence when Wolfsburg were breaking so their counterattack couldn’t be held up, so their defence had to retreat at pace. This is when problems are caused. There were individual errors as well as organisational as Spahic and Papadopoulos had very poor matches. Papadopoulos was at least in part responsible for all of Dost’s four goals as well as Spahic being poor positionally and being sent off in the 81st minute. Neither defender has the pace to be able to keep as high a defensive line as Schmidt desires. Leno was also poor. He should’ve saved Naldo’s free-kick and played pretty poorly throughout. He only made two saves all match and allowed Dost to convert all four of his shots on goal. Game of two halves for Wolfsburg. Wolfsburg were excellent in the first half and as well as the obvious goalscoring acumen that put them 3 up at the half, they stopped Bayer Leverkusen from playing their game. Caligiuri and Vieirinha on the left hand side, and Schürrle and Rodriguez on the right hand side both pressed well and didn’t allow Leverkusen to buildup in wide positions. 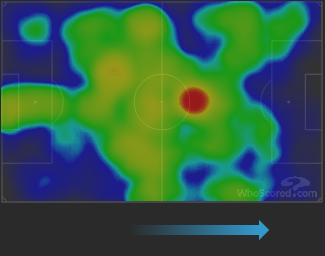 Below is a comparison of their heatmap vs Wolfsburg, and in their 5-1 win vs Köln earlier in the season. Wolfsburg managed to prevent Bayer Leverkusen from building up wide in the first half. Leverkusen ran riot against Köln earlier in the season by building up on the flank (particularly the left). Also, when Leno was on the ball, Wolfsburg’s front four players stayed tight to Leverkusen’s back four to force Leno to play long, therefore increasing the chance of recuperating possession. In fact, Leno only completed 30% of his passes all match–a shockingly low figure. Wolfsburg were a different side in the second half. Leverkusen made three changes and changed to a 4-2-2-2 formation (Drmic, Rolfes and Brandt replaced Calhanoglu, Kießling and Bender). The fullbacks were allowed to push a bit higher up and Castro+Rofles were more protective of the defence. Despite these changes, I think there was one catalyst for the shift in momentum in the match. Heung-Min Son’s highly controversial first goal (foul in my opinion) shifted the momentum. Benaglio and the rest of Wolfsburg’s players were furious and this caused them to become rash in their defending. It also gave Son the confidence to go on and score two more brilliant goals. Benaglio made a poorly timed rush after his defence failed to deal with a long ball and this lead to the Leverkusen’s, and Son’s, second goal. Wolfsburg continued to have issues defending long balls and using their high defensive line which both allowed Bellarabi to use his pace to score Bayer’s equaliser. The game changed again after the equaliser and Bayer Leverkusen were content to sit back. Leverkusen only had one shot in the time from their equaliser in the 72nd minute to the end of the match. Wolfsburg had five in this time. They played in a defensive 4-4-1 after Spahic was sent off with Rolfes playing as a makeshift centre-back. Wolfsburg are now eight points clear of third place and now a Champions League spot looks safe. Contrasting times in North Rhine-Westphalia as they remain 6th in the league but are only two points from a fourth place Champions League qualification spot. Both sides certainly have many positives and negatives to take from the game and the one thing I’d like Schmidt to take from the match is to allow the fullbacks to play higher up the pitch. 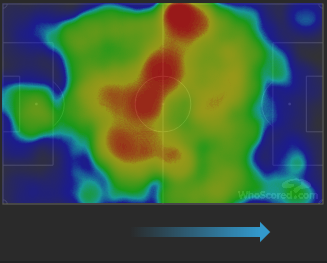 Wolfsburg showed us what benefits playing attacking fullbacks can bring with Vieirinha and Rodriguez getting three assists between them and getting the 1st and 2nd most touches of any players. Wolfsburg’s winner summed up the match: poor Leverkusen pressing, brilliant quick passing from Wolfsburg, rubbish defending from Papadopoulos, and then Dost finishes it off. The whole thing was pure, pure drama.